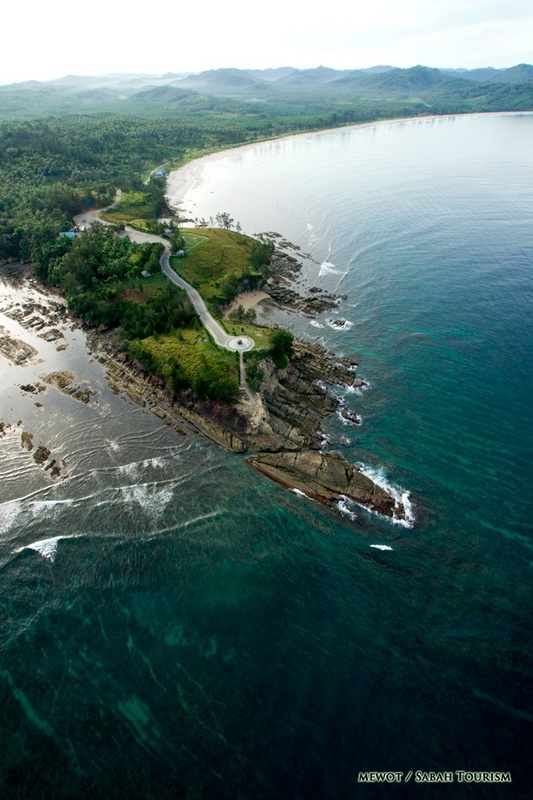 Tanjung Simpang Mengayau or Tanjung Simpang Mangazou, also known as Tip of Borneo in English is the northernmost tip of Borneo located in the district of Kudat, in the state of Sabah, Malaysia. The tip marks the meeting point of the South China Sea and Sulu Sea. 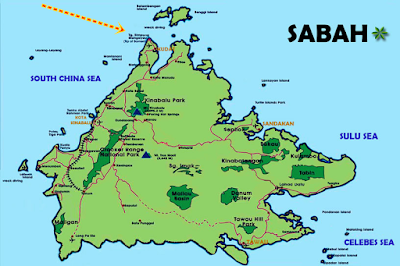 The original name of Tanjung Sampang Mangazou comes from the language of the Rungus, an ethnic group which resides mainly in the district of Kudat. The words Tanjung (cape), Sampang (union) and Mangazou (battle) refers to this location of a battle that occurred when the ethnic Rungus defended their territory against the attack from Moro Pirates. According to legend, this place was a favourite landing point for the pirates. While the Chinese people call this place as Den Foh Liew, which in Hakka means lighthouse due to a lighthouse on a nearby island of Pulau Kalampunian can be seen from here. I've heard and learned about this place from the words of mouth through my friends (that was in early 2014) and eventually I Google around to find out more information about it and finally after over 2 years later, I've been here and I'm proud of it... it's like saying "Shewsbury was here" LOL. From the Tuaran town, it's about 152 km and it takes almost 2 hours and 19 minutes to drive to Simpang Mengayau. Apparently I started my journey from this very town and it takes me about 2 hours and 30 minutes with the relevant traffic conditions and maximum top speed of around 120 km/h to 130 km/h managing my petrol/fuel consumption accordingly. Simpang Mengayau is about 122 km away from Kota Belud town, the last decent small town (assuming if you head out from Kota Kinabalu or Tuaran) with Kentucky Fried Chicken (KFC) restaurant and proper petrol stations. An important advise to you (especially first timers), it is strongly recommended for you to fill in your petrol/gas up to the maximum while you are around Kota Belud town, trust me on this because beyond this point onward you wont find any other "normal petrol station" along that over 120 km route to Simpang Mengayau. Well, apparently there are some "vendors" at certain villages area who happened to sell petrol/gas but then again there are times when they actually "ran out of stock" so if you are on the lowest level on your way back, trust me you will be very worried. The nearest decent small town from Simpang Mengayau which I assume have Kentucky Fried Chicken (KFC) restaurant and proper petrol stations is Kudat which is about 40 minutes away. OK, enough with the boring geography lesson, after the 2.5 hours drive... I arrived and first thing first I stopped at the toilet nearby the beach area heading towards the Tanjung Simpang Mengayau - it's just about a little over 1 km from the destination. Evidently, I drive the fastest car in the world (LOL LOL LOL) to get here... the tiny Proton Savvy that provides almost 80 hp from the 1149cc Renault D4F I4 engine with maximum output speed of a mere 150 km/h with that tiny 13 inch wheels. Done with the usual business you do inside those toilet, I decided to walk to the beach and enjoy the scenery around it and trust me it was brilliant, probably one of the most cleanest beach ever, the scenery is absolutely brilliant while the wind condition on that particular day (June 1, 2016 - around 2.00pm) is quite notorious. At this point, the excitement made me forgot about the long and tiring 2.5 hours journey that I just went through and I just can't help but to enjoy the wonderful scenery and windy condition around the beach, it was fascinating. And after a few great moments spent on that beach, I arrived at the parking space area of Tanjung Simpang Mengayau. An as always, like in any other tourist spot nowadays, people will start taking selfie photos of themselves even at the parking space area.... awesome!!! And this is now the Bronze Globe area where you can see a flag pole and obviously that round thingy in the middle called Bronze Globe. The bronze globe marks the location of Tanjung Simpang Mengayau at Latitude 7 degrees North and Longitude 116 degrees East (Coordinates: 7°02′14″N 116°44′32″E) with a map featuring the island of Borneo is embossed in bronze and laid on a flat surface at an angle with inscriptions to mark the Tip of Borneo. DISCLAIMER: COPYRIGHTS AND PHOTO CREDITS BELONG TO THE OWNER. I DO NOT CLAIM ANY RIGHTS ON THE ABOVE PHOTO. Once you done with all the exploring and fun photo taking activities, be sure to drop by here and grab something to eat, support those local business... there is a toilet available here as well, they charged RM 0.30 per entry (about USD 0.07 / SGD 0.09 / 7.85 Yen) to cover their maintenance charges. Overall, despite the long journey to be here, at the end it was all worth it, every single rubber and petrol burned and those energy and concentration while driving to get you here is really worth it!!! I never regret any of it, it was brilliant experience, absolutely brilliant!!! Though it's not the place you would come often but the excitement and the memories you had around this place is something you will remember dearly in you heart. Someday in the future, I wish to be back here again for sure... that's a promise.